Tuition: Pre-K $6650, K-8 $7650. Sibling and parishioner discounts available. Learn about our principal, Mr. John D'Adamo, and his vision for the school. Roman Catholic; all students participate in daily prayer and attend class masses and school liturgies; religious instruction is required for students in all grades. All students in grades 2-8 use a Chromebook daily for their learning. Additionally, 30 desktop computers and 24 iPads for shared use in the primary grades. All are networked to a school server, and the school is equipped with wi-fi in all classrooms. Every K-8 classroom has a projector, TV, or Smartboard. Learn more about the technology offered at St. Francis of Assisi School. Non-athletic extra-curricular: STEM-Robotics Club, Instrumental Band, Young People’s Choir, Great Books Club, student council, and other activities depending on interest. (Please note that these options vary from year to year). Athletic extra-curricular: indoor and outdoor soccer, track and field, cross country, yoga. Community outreach: Thanksgiving food collections and Christmas baskets for needy families in the community, Catholic Relief Services Lenten Rice Bowl, Vacation Bible School. Additional service activities are organized by the middle schoolers as part of their International Baccalaureate program. Our learning extends beyond our campus into the 375 acres of woodlands of the adjacent Herring Run Park and the 1.3 mile fitness loop around nearby Lake Montebello. 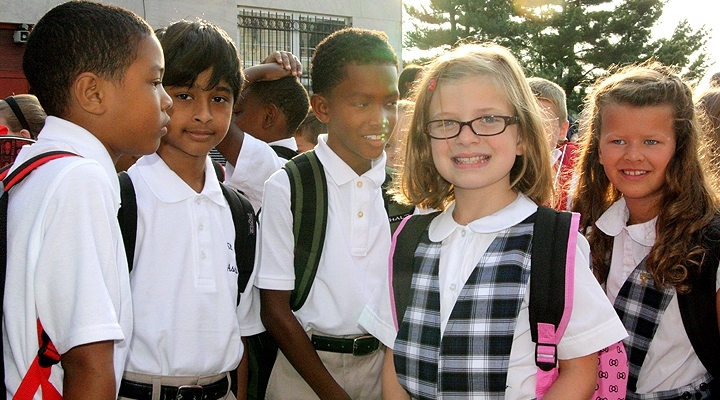 65% of our staff members have sent their own children to Saint Francis. Our school is authorized to offer the widely-recognized International Baccalaureate Program to all Middle School students. This program helps students develop global awareness, habits of inquiry, and collaborative problem solving using the design process. St. Francis was one of the first Catholic elementary schools to offer a 1:1 technology program. Currently we have multiple computers in every classroom. Technology is integrated throughout the curriculum. Our Middle School STEM Club and Design classes are enriched through the use of 3-D printers. More than 45 heritage countries are represented in our school community. Our Athletic Association enrolls over 300 children from the school and neighboring communities. Daily mass is available for all members of the community. St. Francis of Assisi School has been recognized with the Bronze Award from the Maryland State Dept. of Education for our efforts in this area!